As most of Ukraine goes to the polls, its breakaway region of Donbass remains a no man's land - caught between Russia and Ukraine, unable to determine its direction. “We love our country and we’re ready to give our lives for it,” read a poster bearing the signature and the image of the recently assassinated leader Aleksandr Zakharchenko, past the checkpoint on the road to the city of Donetsk. “If only there was a country,” my driver said, deadpan. He said he found it harder to breathe after crossing to the self-proclaimed Donetsk People’s Republic. I tried to understand what this self-proclaimed republic was, exactly, but it kept escaping me. Donetsk was built as Yuzovka (‘Hughesovka’), by the South Wales industrialist John Hughes, in the 19th century. It was renamed Stalino in 1924, and Donetsk in 1961. It looked pretty in the cold winter days of November. The first thing you notice when driving to the city across the checkpoints is that it’s still a mining town, as slag heaps kept appearing. Industrial development gave its identity to the Donets basin (Donbass in Russian, Donbas in Ukrainian) region and made it a land of migration. Explaining that the region used to be a “wild field,” a “no man’s land” attracting outsiders, the historian Hiroaki Kuromiya wrote in 1996: “What has defined Donbas politics was (and still is) a fierce spirit of freedom and independence. Independence did not preclude the possibility of a pragmatic alliance with foes and outsiders, a behaviour that often appears to be unprincipled, mercenary and lacking perspective. This spirit is a historical product.” These words resonate strangely today. Metalworks and mines were the centre of the regional economy, and while the region suffered heavily from closures and mass unemployment in the 90’s, it became one of the battlegrounds of gangster capitalism during the transition era, with several of Ukraine’s most prominent oligarchs making their fortune in the region thanks to privatisation. In the aftermath of the Maidan protests, the region seceded and declared itself an independent state in May 2014. Since then, the self-proclaimed republic engaged in a bloody struggle with the Ukrainian government. Four years after its secession, the DNR held elections on 11 November 2018, which is what brought me to the city. The first person I met in town, Elmira, a woman in her early twenties who was waiting for someone in Lenin square, by the DonMak (that’s how the MacDonalds was renamed after 2015), told me she didn’t have a local sim card yet: “I never got a Phoenix because you’re supposed to show your passport to get one, which was never the case with Ukrainian sims, and that felt weird.” Later I went to the Phoenix shop and showed my passport to get a sim. 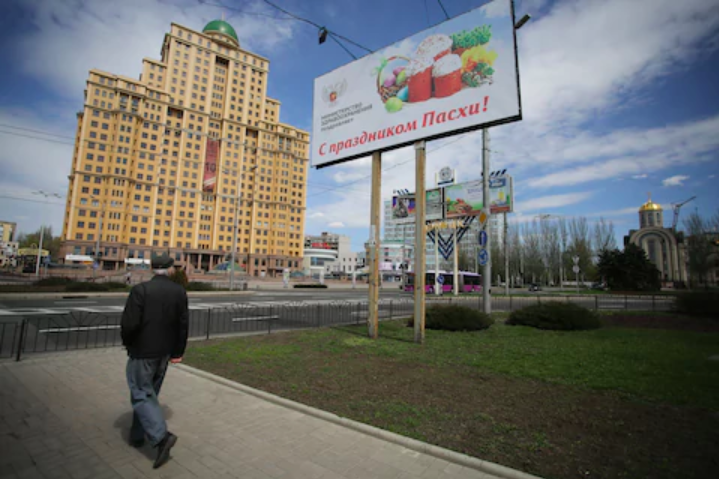 On the wall, an advert showed the territory covered by the Phoenix network, the Donetsk People’s Republic and the neighbouring, similarly-unrecognised Lugansk People’s Republic, also in the Donbass region. In the shop, they also sold phones allowing you to use two sim cards, a Ukrainian and a Phoenix one, according to which number you are dialling. It felt like an apt metaphor for a territory which seems to be stuck between different realities and different countries. I drank ginger tea with François Mauld d’Aymée, a young Frenchman who moved to Donetsk a few years back, when many were leaving. He told me he loved the city, because it was a village, “like Montmartre at the turn of the 19th century, where composers would constantly bump into each other”. He was singing at the Philharmonic, getting an education in Russian music at a bargain. “Me, I quite like the curfew”, he said. “No one’s messing around at night. Here there’s no alcoholics, no drug addicts, no one engaging in mad rodeos, there’s none of these people who ruin other people’s lives. These measures might be a bit extreme but they’re quite successful. They prevent people from hurting themselves.” In fact, Donetsk might just have been his ideal place, one that could attract some European far-right supporters. It had few foreigners other than him. “Many troublesome things have disappeared, tourism, cosmopolitanism,” he said, smiling. The DNR seemed stuck. I thought the image of the fog was a good one. And there was also fear, a general reluctance to talk, questions you couldn’t ask. Russian paramilitaries had never been here was the official line, repeated many times, only patriots who came of their own volition. Corruption had been eradicated. Sometimes a few people would chance to tell me something, but it would generally be quickly, discreetly, and completely off the record. Back in Kyiv people looked at me with suspicion for even having been there. I went to see the film Donbas, by Sergei Loznitsa and hated it because it depicted people from the Donbas as if they weren’t people. As the Ukrainian elections approached, all the candidates claimed they would stop the war while providing little detail on how they would do it. Valeria Costa-Kostritsky is a writer based in London. She has contributed to the LRB, The New Statesman and L’Obs.